Riley Keough, Jena Malone, Jessie Ok Gray et al. Neglected by her husband, Sarah (Riley Keough) embarks on an impromptu road trip with her young daughter and her best friend, Mindy (Jena Malone). Along the way, the dynamic between the two friends intensifies before circumstances force them apart. Years later, Sarah attempts to rebuild their intimate connection in the days before Mindy's wedding to Leif (Ryan Eggold). Quietly cinematic and picturesque, and peppered with unexpected supporting turns from the likes of Rosanna Arquette, Brooklyn Decker and Amy Seimetz, 'Lovesong' is a bittersweet, beautifully modulated love story about muted desire and the grey areas that define every friendship, romance and marriage. 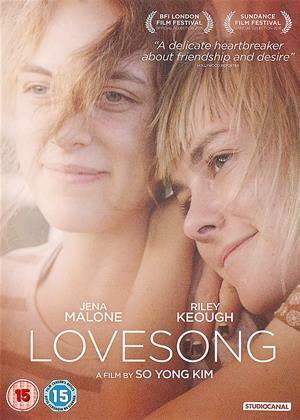 Lovesong is directed by So Yong Kim and stars Riley Keough as Sarah and Jena Malone playing Mindy in the main roles. Sarah is a married woman whose husband is almost always on some sorts of business trips, meaning she’s alone the majority of her time. Mindy is Sarah’s long-term friend who lives in New York City and does her thing from there. Their relationship teeters on the verge of something more than just friends (albeit not explicitly shown, but subtly implied by the director). So far so good. However, Lovesong also plays with a script that could’ve been better realised than what we got as a final product. And thus, the film ends up being just OK, and that’s cool. The two main leads (Riley Keough and Jena Malone) are portrayed as moody, reactive as opposed to proactive, and often times verbally closed off as well. Now, this would’ve played wonders if one of the characters was introverted and the other the total opposite of that; instead, both women barely speak to each other and have little to do over the course of the film, which is why we can’t connect with their thought processes on a deeper, more humane level. For instance, Sarah has a daughter, but she doesn’t do anything to urge Jessie (both played by Jessie OK Gray and Sky OK Gray as a three and a six year old respectively) to go outside and explore the world on her own terms (probably the script’s fault). What Sarah does instead is sits at home and contemplates to no avail. Then we have Mindy – a carbon copy of Sarah insofar distinctive character traits go. She is charming I give her that, but raw charm can only take you so far. And both Mindy and Sarah are attractive, which is all we get from the movie apparently. Two hot ladies with a mutual crush that doesn’t really develop into anything. Naysayers would probably defend the aforementioned statement by rule of straw-man, and they would possibly hit the nail on the head; as they do that, I’ll go right ahead and un-nail myself from the seat, take my cinema trash with me, dump it in the garbage can, and go watch a hockey match or something. Case in point: Lovesong is one of those films that are okay to watch and forget about them forever after. And if a movie doesn’t stir up as little as a friendly banter after viewing, then you know it didn’t have much going for it in the first place. Finally, Lovesong is an okaish film about two attractive friends who… wait a minute! I said that before somewhere didn’t I? Yes I did! And this is folks how it feels to sit through Lovesong. Full stop.